Early in our country’s history, Congress decided that education was extremely important. The problem was: how to fund public education? Since there was little money, but lots of land, Congress, under the leadership of Thomas Jefferson, gave land grants for public education to new states as they came into the Union. Beginning with Ohio in 1803, every new state received a land grant. The states then obtained funds for education by leasing or selling the land. On April 19, 1864, the U.S. Congress passed, and President Abraham Lincoln signed, the Enabling Act as a prelude to Nebraska Statehood. Upon admission to the Union in 1867, Nebraska received 2,797,520 acres of land for the “support of the common schools.” The original endowment represented nearly one eighteenth of the land in Nebraska---an area larger than the states of Delaware and Rhode Island combined. The original grant represented Sections 16 and 36 in each Township “or lands in lieu thereof.” This “in lieu” provision was necessary because settlers living on these Sections (mainly in the eastern part of the State) before statehood were allowed to remain on the land they had settled. Thus, lands in Sections other than 16 and 36 were occasionally selected for the School Trust. As was true of virtually all land-grant states, Nebraska had its share of early day problems related to the School Lands. In the period before 1900, corruption, cronyism, and managerial incompetence plagued the administration of the School Lands. As a result, almost half of the original acres were sold at bargain prices to private-sector owners and land speculators. The Board recognizes that it holds the School Land in “a sacred trust” and conscientiously administers the Trust consistent with its mandated fiduciary duty toward its sole beneficiaries---the public school children of Nebraska. Each year, the land produces millions of dollars of income for public schools. The Trust Land not only produces a steady flow of net income, but the land continues to appreciate at an impressive rate. Proceeds from any land sales are distributed from the School Land Trust to the Nebraska Investment Council for investment in stocks and bonds, with the annual income from the proceeds of land sales also being paid out to the K-12 public schools. The Board is also aware of the importance of carefully managing its expenditures. 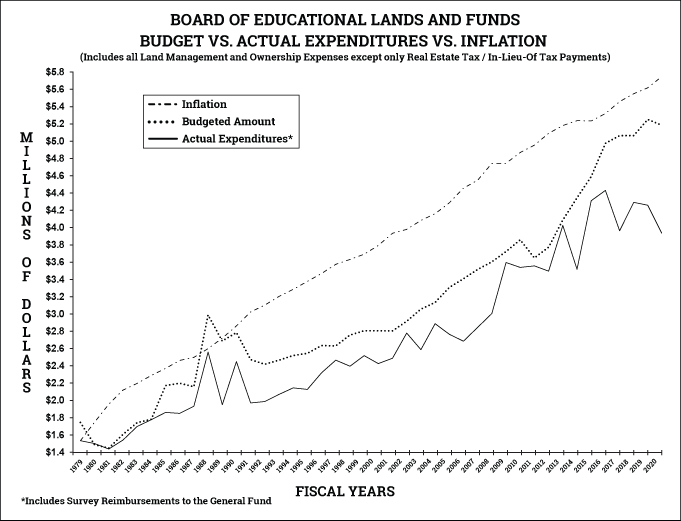 The graph below demonstrates that for the last 37 years the U.S. rate of inflation has far exceeded increases in the Board’s expenditures. Except for two years when the current office building and a large computer system were purchased, over the last thirty years the Trust’s expenditures have consistently been below the annual rate of inflation. The Board is confident that this trend will continue. Expenditures will continue to be closely monitored and reviewed. Detailed monthly reports are provided to the Board, and budgets are reviewed and approved annually by the Board. The Board will continue to examine ways to reduce costs consistent with its mission.